What’s next for the Dakota Access Pipeline? In the standoff over the Dakota Access Pipeline, neither side is calling it quits after a recent decision by the U.S. Army Corps of Engineers to halt a final leg of the project in order to research alternate routes. The Army Corps on Sunday refused to grant the permit needed to build a section of the pipeline under the Missouri River near the Standing Rock Sioux Reservation, a decision that the tribe celebrated as a victory. The agency ordered that alternate routes be explored. The Standing Rock Sioux and supporters say the $3.8 billion project disrupts sacred burial grounds, and threatens the tribe’s main source of drinking water and violates the terms of an 1851 treaty with the U.S. government. Large crowds of demonstrators set up camp near the proposed route in August, refusing to leave until the project is stopped. Now, following the Army Corps’ decision, both sides are assessing their next steps. 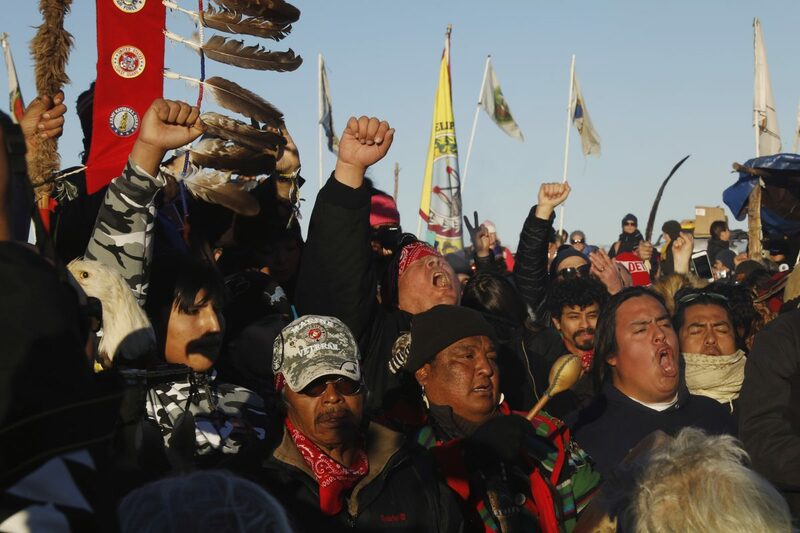 “[Our] mission has been accomplished,” Standing Rock Sioux tribal chairman David Archambault II told Reuters. He then turned to the protesters’ next major hurdle. “With the new administration coming in, it’s an opportune time for us to educate the President-elect and help him realize that what he has achieved is only because of the cost that our people have paid,” Archambault said. Despite the harsh weather and Army Corps decision, reports say demonstrators continue to show up at Standing Rock. Some protesters took shelter in local casino resorts after blizzards blew through the main encampment. 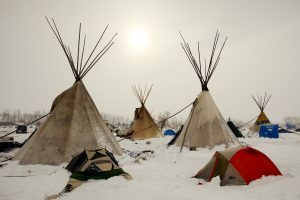 Archambault has said that protesters should vacate the main encampment as North Dakota grows colder this winter. “It’s time for everybody to go home and be safe,” he told Reuters. A federal court could still rule in favor of Energy Transfer Partners, ordering the Army Corps to grant a permit for the pipeline. Meanwhile, President Barack Obama could designate the federal land near the Missouri River a national monument, forcing Energy Transfer Partners to find another route. But it is unclear whether he has any plans to do so. President-elect Donald Trump has said he supports the pipeline, and Trump’s spokesperson Jason Miller told the Associated Press on Monday that he will review the situation. Trump also recently formed a Native American Coalition, which is markedly pro-business. New Mexico State Rep. Sharon Clachischillage, one of the coalition’s 27 members, said the Trump administration will “ease restrictions on American energy reserves worth trillions of dollars.” She said that will benefit Native Americans living in areas with abundant natural resources. What can other pipeline protests learn from Standing Rock? Some protesters plan to remain at the pipeline camp, despite tribal council leaders advising them to go home. Others are focusing on how the recent protests against the Dakota Access Pipeline could be replicated elsewhere. Native and environmental groups are protesting the expansion of the Alberta Clipper pipeline, which the State Department approved in 2009 and spans 1,000 miles from Hardisty, Alberta to Superior, Wisconsin. Protesters say the construction will harm the production of wild rice on tribal land. A separate project, the Trans Mountain pipeline, owned by Kinder Morgan Energy Partners, has proposed a new expansion that critics say could endanger nearby lakes. Kinder Morgan aims to begin construction on the pipeline by 2017 and complete it by 2019. Winona LaDuke, the executive director of the nonprofit group Honor the Earth, called these pipelines “catastrophes waiting to happen” in a blog post. In October, climate change activists tried to shut off pipelines in five places in the U.S. One of the protesters, Ken Ward, was arrested and charged with criminal trespass and burglary after he went live on Facebook while he closed a safety valve of the Trans Mountain pipeline, owned by Enbridge. Ward said his actions were in solidarity with Standing Rock.